The bright and juicy dark chocolate is given an even fruitier twist thanks to the addition of orange peel and cranberries. This bright and juicy dark chocolate is given an even fruitier twist thanks to the addition of orange peel and cranberries. The sweet but tart dried fruit give the bar a fabulously festive flavour that reminds us of richly spiced mulled wine and satsumas. 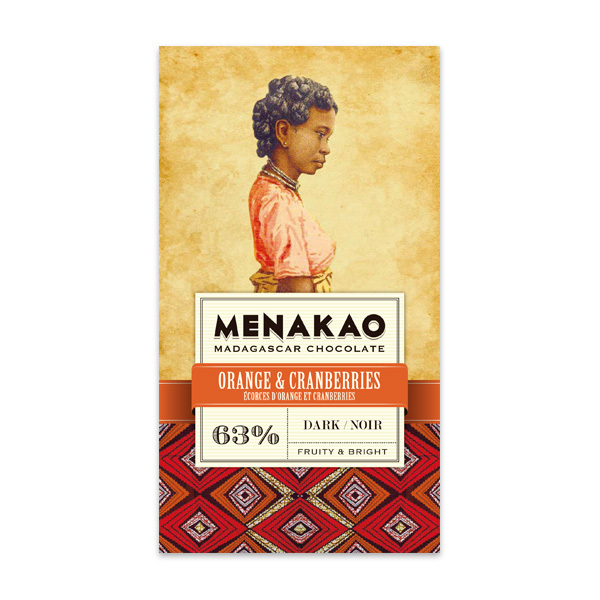 In honour of the men and women of Madagascar of all ethnicities who are at the heart of Menakao chocolate, Menakao decided that the bars should proudly bear the image “not [of] the face of Madagascar, but [of] Madagascan faces.” The beautiful image on the wrapping of this bar is of an Antanosy woman. The Antanosy (Antanosy meaning “people of the island”), live in the Fort Dauphin region, described by Menakao as “a cool oasis at the crossroads of the mountains, the desert and the Indian Ocean.” This has given rise to the prominence of the Antanosy on both land and sea as esteemed sailors, fisherman and farmers. Cocoa beans, cane sugar, pure cocoa butter, cranberries, orange peel, orange essential oil. Emulsifier: sunflower lecithin. May contain traces of nuts, gluten, eggs and dairy. This bar is perfectly delightful. Opening the bar and tasting makes me feel like I've traveled. Not too sweet, nor sharp. Creamy and a little bit chunky. I love giving these away for gifts. Bought a carton. More satisfying than some so you can have just one piece and be satisfied.